According to the American Academy of Pediatrics (AAP), fruit juice has no nutritional value to kids age 1 and younger – and it should not be included in their diet. Milk or formula is recommended for infants. This, outlined in the organization's 2017 recommendations, is a change from earlier guidelines that juice was not suggested for children younger than 6 months. The AAP notes that the expansion of the recommendation to include a baby's entire first year comes because of rates of childhood obesity and dental issues. Juice can have a place in your child's diet, should you choose, but think before you pour. It's important to remember that the AAP stating that toddlers can have juice doesn't mean they encourage it. Low-fat or non-fat milk and water are preferred. Keep in mind that this is really a daily limit and not an endorsement for drinking juice. Some say constipation in infants under six months can be improved by some fruit juice; always check with your pediatrician before trying this. There are several reasons to consider avoiding (or at least limiting) juice consumption in your child. The first is that plain old, whole fruit is simply better, as juice lacks fiber and has more sugar and calories. The AAP's guidelines even include a suggestion to parents to talk to their kids about the difference between, say, an apple and apple juice – and why they should choose one over the other. Of course, the most obvious concern with added calories and sugar is weight gain. The AAP states that "excessive fruit juice can lead to excessive weight gain," and that consumption can and does play a role in obesity. Another concern with the extra sugar juice provides is cavities, particularly in kids who consume a lot and/or sip throughout the day. A constant "washing" of juice over teeth exposes them to carbohydrates, which can cause tooth decay. 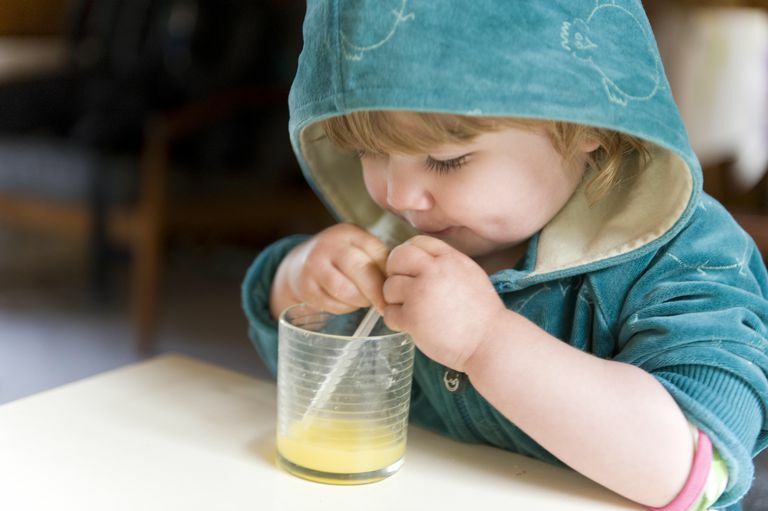 That's why the AAP suggests giving your child juice in a regular cup, rather than a sippy cup or bottle, which is a lot easier to drink from again and again. Drinking fruit juice can also contribute to toddler's diarrhea. If you think fruit juice causes your child to have loose stools, either avoid juice or switch to one like white grape juice. Other juices, especially apple and pear juice, contain sugars that sometimes lead to malabsorption and diarrhea in some kids. Choose 100 percent fresh or reconstituted fruit juice. Ensure that your child's diet is otherwise healthy and balanced. Only give kids juice that has been pasteurized. Do not give juice to kids at bedtime or in the middle of the night. If your child takes medication, check to be sure that grapefruit juice will not interfere with its effectiveness or cause side effects before serving it (although, kids will likely prefer something less sour anyway). Avoid reaching for fruit juice as a treatment for dehydration or diarrhea. Heyman, Melvin B. Abrams, Steven A. Fruit Juice in Infants, Children, and Adolescents: Current Recommendations. Pediatrics. 2017; 139 (6). Can You Breastfeed and Give Your Baby Infant Formula? When Can Your Baby Drink Water? When Can I Feed My Baby Eggs? When Is It Safe for Babies to Eat Honey?